NOTE: No tickets are issued in an effort to cut down on paper products; your name will be at registration desk. Our Conference fees are on a SLIDING SCALE to make this event as accessible to as many women as possible and to recognize the differences in our incomes; a sound feminist principle. Please pay what you can afford on the sliding scale. 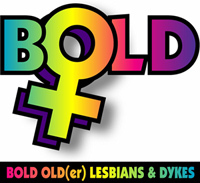 The bottom end of the scale does not cover the actual costs per person but with the help of those who can pay mid to high end, plus whatever fundraising we do, BOLDFest will always be open to women of various means, including those who ask for, and receive, subsidies and full scholarships. 1-Pay via PayPal then scan/copy your REGISTRATION FORM AND EMAIL to info@boldfest.com. Please note your PayPal confirmation codes on your form. Paying via PayPal has 5 preset payment levels on the sliding scale (see above) for the registration and also includes the service fees charged to us by PayPal. 2 -Pay by cheque/check made out to BOLD and mail with your registration form to POB 21510, 1424 Commercial Drive, Vancouver BC V5L 5G2 Canada. If paying via cheque, you can choose the exact amount you wish to pay on the sliding scale (see above) from $230.00 to $415.00 Canadian. You do not have to use the preset PayPal values as these include service fees and are limited to 5 preset payment values for ease of online processing. Please note that on the bottom of the registration form is a line to request a subsidy. Please let us know what you can pay toward the $230.00 bottom end of the sliding scale. We will do what we can to cover the rest of your costs. We will try to give full scholarship to a limited # of women, depending on our financial ability to do so. Please ask; we'll let you know what's possible. We appreciate donations in any amount. Donations go toward supporting several women to attend BOLDFest each year as well as help with conference expenses. You can donate by credit card using the donation button or by mailing in your cheque/check using the registration form. Thank you for your support!